¶The nonhydrostatic model LM was developed for small scale operational predictions. Advances in computer development will give the possibility of operational models of a rather fine scale, which will cover the meso-gamma scale. The LM is currently applied at a scale of 7 km and an increase of the operational resolution to 2.5 km is planned for the next few years. Predictions of such high resolution require to abandon the hydrostatic assumption, which is used with most current operational weather prediction models. The LM was designed to cover all resolutions from 50 m to 50 km with an efficiency making it suitable for operational use. It is a fully elastic model, using second order centred finite differences. The time integration is done using the Klemp–Wilhelmson method, treating the slow modes by a larger time step than the fast modes. The vertical propagation of the fast waves is done implicitly. 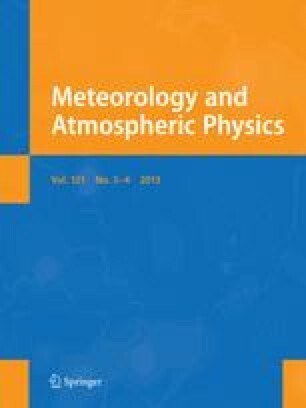 After describing the design of the LM, this paper gives examples of model predictions at the meso-γ scale. Some results of the current operational application at the resolution 7 km are presented. Deficiencies in the localisation of model generated precipitation are investigated using an idealised bell shaped mountain and applying different resolutions. In this way the convergence to the correct solution can be investigated. From these results it is concluded, that orographic filtering is necessary and the effect of such filtering on precipitation forecasts is investigated. Finally, the prediction of a squall line over northern Germany is shown in order to demonstrate the potential of the model in forecasting the meso-γ scale.